(CNN) -- Pakistani President Asif Ali Zardari denied his nation was involved in last week's deadly attacks on Mumbai, India, and told CNN on Tuesday he's seen no evidence that a suspect in custody is a Pakistani national as Indian officials claim. Pakistani President Asif Ali Zardari says he believes the Mumbai attackers were "stateless actors." "I think these are stateless actors who have been operating all throughout the region," Zardari said on CNN's "Larry King Live" in an interview set to air Tuesday night. "The gunmen plus the planners, whoever they are, [are] stateless actors who have been holding hostage the whole world." Indian officials have publicly blamed Pakistani militants for the attacks, and called on Pakistan to hand over a group of wanted militant leaders suspected of plotting them. On Tuesday, Pakistani Foreign Minister Shah Mahmood Qureshi proposed a joint investigation into the attacks and said, "This is not the time to point fingers." 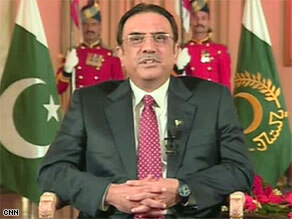 Zardari confirmed he is willing to have Pakistani security officials participate with India in a joint investigation. "The state of Pakistan is in no way responsible," Zardari told King. "... Even the White House and the American CIA have said that today. The state of Pakistan is, of course, not involved. We're part of the victims, Larry. I'm a victim. The state of Pakistan is a victim. We are the victims of this war, and I am sorry for the Indians, and I feel sorry for them." Indian officials have said that the only suspected attacker in custody has told police he is a Pakistani national. Indian intelligence sources have told CNN's sister network, CNN-IBN, that police believe all the attackers were Pakistanis. Pakistani President Asif Ali Zardari talks to Larry King about the Mumbai attack on Larry King Live. Indian police say nine of the 10 attackers were killed by Indian forces. Asked about the suspect in custody, Zardari said: "We have not been given any tangible proof to say that he is definitely a Pakistani. I very much doubt it, Larry, that he is a Pakistani." He said Pakistan is looking into the allegation, but added, "Like I said, these are stateless individuals. ... We've had incidents the past two days in Karachi where we've lost more than 40 to 45 people, hundreds injured. These are stateless actors who are moving throughout this region." India summoned Pakistan's high commissioner, the top-ranking Pakistani diplomat in New Delhi, to External Affairs Minister Pranab Mukherjee's office Monday to inform him that last week's massacre in Mumbai "was carried out by elements from Pakistan." It renewed a demand that Pakistan hand over a group of militant leaders whose extradition it has sought since a 2001 attack on India's Parliament that brought the South Asian nuclear rivals to the brink of war. "The government expects that strong action would be taken against those elements, whosoever they may be, responsible for this outrage," a statement from India's Foreign Ministry said. "It was conveyed to the Pakistan high commissioner that Pakistan's actions needed to match the sentiments expressed by its leadership that it wishes to have a qualitatively new relationship with India." The list reportedly includes Hafiz Mohammed, the head of Lashkar-e-Tayyiba, a now-banned Islamic militant group that denied last week that it was involved in the Mumbai attack. The group is blamed for the 2001 attack on India's Parliament. "I am definitely going to look into all the possibility of any proof that is given to us," Zardari said. "At the moment, these are just names of individuals. No proof, no investigation, nothing has been brought forward." If proof of the individuals' involvement is provided, he said, "We would try them in our courts, we would try them in our land, and we would sentence them." Indian authorities said the suspect in custody was trained by Lashkar-e-Tayyiba. Zardari told CNN that Lashkar-e-Tayyiba is a "banned organization" in Pakistan and around the world. "If indeed they are involved, we would not know," he said. "Again, they are people who operate outside the system. They operate like -- al Qaeda, for instance, is not state-oriented. They operate something on that mechanism, and ... I've already offered India full cooperation on this incident, and we intend to do that." "I'm firmly committed to fighting terrorism per se," he said. "That's why we are fighting them every day, Larry." Asked about the possibility of Indian military strikes against terrorist camps in Pakistan, Zardari said: "I would not agree with that because this is a time to come together and do a joint investigation and look at the problem in the larger context. We have a larger threat on our hands ... it's a threat throughout the region. So that would be counterproductive." "The whole nation of Pakistan is united to ... becoming friends with India," he said.